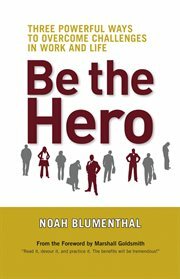 The item Be the hero : three powerful ways to overcome challenges in work and life, Noah Blumenthal ; foreword by Marshall Goldsmith, (ebook) represents a specific, individual, material embodiment of a distinct intellectual or artistic creation found in Charlotte Mecklenburg Library. At times we all feel frustrated, stressed, or out of control. What if you could be at your best when your challenges are on the rise? Well, you can. Be the Hero introduces us to the way of the "Everyday Hero" and shows how to turn self-defeating thoughts and behaviors into heroic actions. All day long, without even realizing it, we tell ourselves dozens of stories-about other people, our situations, and ourselves-stories that shape our emotions and behavior. These stories are so powerful, they make us think and act like either a hero or a victim. Be the Hero shows you how to choose the stories that lead to personal and professional success. In the tradition of the best storytellers, Noah Blumenthal weaves a tale of a young professional's journey from victim to hero, one that is both captivating and profound. The powerful resources at the end of the book, including a hero tip of the week, smart cards, manager tip sheets, and more, will help you make your hero stories stick "